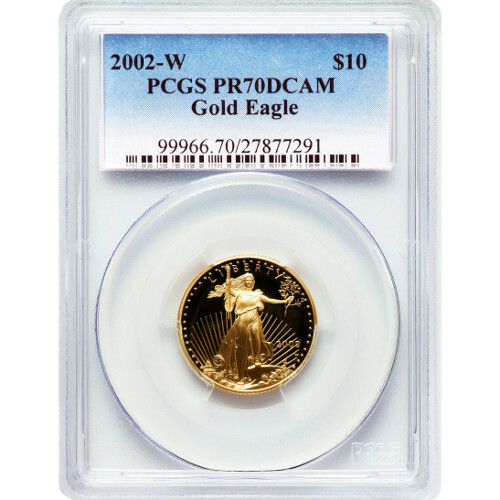 The 2002-W 1/4 oz Gold American Eagle is available from Silver.com with a PR70 grading from the Professional Coin Grading Service. 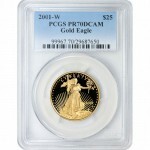 Each coin has a Deep Cameo appearance and contains 1/4 troy ounce of pure gold. They also have a $10 face value and ship sealed in a PCGS coin slab with a unique serial number. On the obverse is Lady Liberty as first depicted on the $20 Saint-Gaudens gold coin between 1907 and 1933. Lady Liberty is featured walking forward with a torch in one hand and olive branch in the other. The reverse includes Miley Busiek’s image of a nesting family of eagles. A well-known sculptor, Busiek was asked to create the image specifically for the Gold American Eagle series. The US Mint was established in 1792 following Congressional approval of the Coinage Act. With 223 years of mintage history, the facility is one of North America’s oldest. If you have questions about Gold American Eagles, we encourage you to call us at 888-989-7223 or online using our live chat.